Carol Becker, preeminent arts educator and contributor to leading art magazines, offers a beautifully poignant meditation on the role of place in artistic creativity. She focuses on place as a historical, physical entity and a conceptual site where ideas come into meaning. The book explores places from the coal-mining towns of western Pennsylvania, to the Birla House where Gandhi was shot, to the sinking city of Venice. A cross between theory, memoir, and history, her writing creates the experiential effect of being in specific places as well as imagining the evolution of ideas as they are manifested in museums and often become agents for social change. 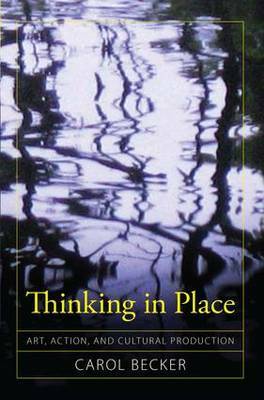 "Thinking in Place takes us on an extraordinary pilgrimage through the world of neighborhoods, communities, and art in all its forms and transfigurations, guided by a widely traveled, deeply thoughtful, cosmopolitan scholar. Carol Becker's ability to see significance and value in the large and the small, the permanent and fleeting, the far and the near somehow makes me think of William Blake's paean to the human imagination as that which can see "the world in a grain of sand, and heaven in a flower.'" "Art educator and social critic Carol Becker challenges us with her reflections on the constitutive importance of place in art and in life. Part memoir, part meditation on political violence and art making in recent times, these essays transcend the narrow boundaries of Western `global art' think, showing how writing about the arts is more than ever deeply implicated in multiple histories and social struggles." "Carol Becker is a gifted story teller with a rare ability to reanimate decisive, yet for Americans largely forgotten, histories after pilgrimages to the sites in which the shattering events occurred. Through her learned and fluid tellings, she argues repeatedly, and eloquently, for the connection between place and memory. Without an embodied relationship to place, and a personal and collective commitment to creative witnessing of the stories that make places repositories of trauma and energy, Becker cannot imagine community and progress. By linking such witnessing to the processes of artists, many of whom, she points out, persistently and fearlessly reinvent the personal and collective past through image and myth, Becker underlines the need for artistic creativity in post-9/11 America. The questions her book raises about the body and memory, and creativity and history, could not be more timely." "For Carol Becker, traveler, there are no roads; she makes her path as she walks and takes the only road that can be taken, the ethical one. And along her extraordinary path, she creates spaces of hope and resistance. Her long journey takes us to centers of western culture and helps us separate the culture from the spectacle-and identifies the difficulties ahead. She also takes us to places with no names, inhabited by people without names. She names them, and the naming is a revelation that illuminates these dark times and questions all of our assumptions about our own cultural values. This is an extraordinarily generous and deeply challenging book, that gives as much as it demands."